The MC1008 series Ethernet media converters are designed to extend the distance of your network by interconnecting LAN devices that are physically separated by large distances. These media converters have the functionality to connect any managed/unmanaged 1000Mbps switch or hub using standard 1000T RJ-45 connections and convert the signal to 1000Base optical via a GBIC. The pluggable optics feature allows for flexible network configurations of reach whilst reducing the number of products for sparing and inventory. Each AT-MC1008 media converter features a 1000T twisted pair port and a GBIC port. The twisted pair port has an RJ-45 connector and a maximum operating distance of 100 meters. 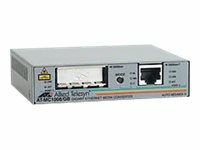 For the AT-MC1008/GB, the fiber optic port has a GBIC slot and a maximum operating distance dependent on the GBIC. Although the provisioning of Gigabit Ethernet connections is becoming relatively inexpensive, thanks in part to the availability of lower-cost copper Gigabit network adapters, the distance limitations of copper cabling make fiber segments a necessity in most networks. Small, comparatively inexpensive copper to fiber Gigabit Ethernet media converters present a simple and very cost-effective way of connecting Gigabit Ethernet LANs over extended distances. Each small media converter is powered by an external power supply unit for use in standalone applications. Where multiple media converters are used, up to 12 standalone devices can be inserted into a low-cost rack-mount chassis, allowing all the converters to be powered by a single internal power supply. In critical applications, a second load sharing internal power supply can be installed into the rack-mount chassis.